What is Sport & Social? Sport & Social is a club for people who want to get our the house mid-week and enjoy the company of friends new and old while playing playground sports. 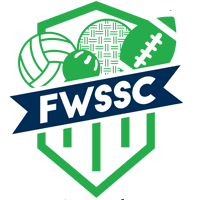 FWSSC leagues are tailored for individuals, friends, groups, couples, and company teams who enjoy bring both physically and socially active. FWSSC provides the opportunity for you to play games with other young professionals in Fort Wayne, then grab a drink and hang-out afterwards. Oh YEAH! That’s the whole point of FWSSC leagues. We understand how awkward it can be to make friends as an adult, or how terrible awkward most networking events can be. FWSSC leagues provide you that common “thing” to talk about. At the games you’ll be interacting with your team and the team you’re playing. At the partnered bar after the players start up games of pong, corn-hole, flip-cup, ect. You will already have the shared experience of the league to break any ice (way better than the polar bear line). You’re in a group of young professionals that all like to play playground sports, who like to get out of the house, and enjoy socializing. Yeah, you’ll meet people. Sports are seasonal. 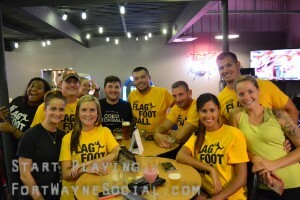 Our most popular sports are Kickballl, Dodgeball, and Flag Football. We also offer broomball, corn-hole, beer Olympics, soccer, and Grass Volleyball. As space and resources are uncovered more sports are added, so make sure to check back if you’re favorite isn’t yet available. I don’t know anyone who wants to play, can I still get on a team? Of course. You are what we call a Free Agent, Congratulations! You are about to meet a bunch of amazing people. As a Free agent you can be recruited by a team captain or placed on a team once registration closes. You’ll receive an email letting you know, as well as what color shirts your team will be receiving. Can I be on the same team as my friend, partner, ect? Yes. Due to current website limitations you do need to send an email, but that’s it. Once you are both (or all) signed up, simply let our office know: office@fortwaynesocial.comIf a mistake happens and you are not on the same team, do not sweat. Just remind that same email and we will switch you over in a jiffy. What if I don’t have enough people for a whole team? Partial teams are no problem at all. Other players sign up as free agents (meaning they don’t have a team). Partial teams and FA’s are peas on a pod, or well, players on a whole team. Captains can recruit from the FA pool, or FA’s will be added to their team at the close of registration. This is sport specific. Information on the number of players is on the registration page for each sport. For example Kickball is 12, Dodgeball is 10, and Volleyball is 6. There are minimum and maximum number of players allowed for each sport, also found on the registration page for that sport. What if I don’t register and pay y the deadline? What do I need to do as a captain? FWSSC will do our best to hold off any inclement weather. In the event we fail you will be notified via email. If the weather looks bad you will receive an email in the morning letting you know to be on the lookout. If the games are to be cancelled you will know between 4-5pm. Any cancelled games will be played at the end of the season. For example, if week 3 is cancelled, that game will become a week 8 game. Do League Champions win anything? Team Captains have a very important role. You will need to know who is going to miss the game to coordinate substitutes, Play rock-paper-scissors when necessary (instead of coin flips), enter your score at the conclusion of games, and be the rule-knower for your team. Absolutely NO refunds, credits, vouchers, or transfers to a future season, no matter the circumstances (which also includes, but is not limited to moving, illness, and/or injury), within seven days (one week) of the originally posted start date of the league or class. There will be a $15 processing fee for refunds prior to the 7 day window. This is because we have already created a custom shirt for you and already evenly distributed players amongst teams. You are welcome to pick up your shirt as part of that $15 fee.